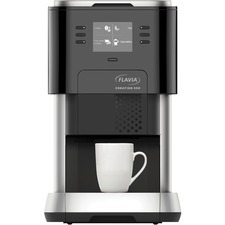 Flavia Creation 500 blends stylish design with enhanced drink and menu display options making it easier than ever to create and enjoy the perfect brew. High-performance workplace brewer is designed especially with the needs of large offices and collaborative areas in mind. Enhanced LCD menu provides a more intuitive brewing experience. The quick, easy-to-use technology delivers single-serve drinks directly from Freshpack to your cup in less than a minute. Choose from a variety of single-serve drinks including freshly ground coffees, real-leaf and herbal teas and premium hot chocolate. Innovative technology enables you to brew authentic frothy cappuccinos, lattes and mochas so you can enjoy coffee shop specialties right in your office. 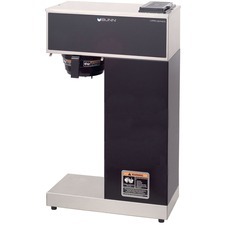 It is portable and flexible with pourover and plumbed-in options for easy office placement. 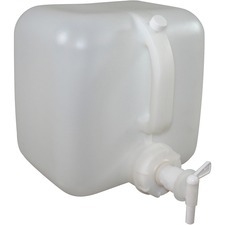 Easy-fill water tank holds up to 101.4 oz. Design also includes a removable drip tray. Flavia Creation 200 is designed especially with the needs of medium-sized offices and collaborative areas in mind. It's perfect for 15 to 49 employees. Cutting-edge design, easy-to-use interface and fresh, quality drinks make it your perfect partner at work. The quick, easy-to-use technology delivers single-serve drinks directly from Freshpack to your cup in 40 to 60 seconds. Choose from a variety of single-serve drinks including freshly ground coffees, real-leaf and herbal teas and premium hot chocolate. 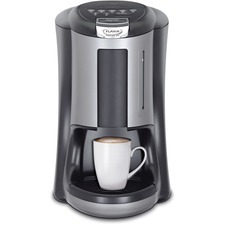 Innovative technology enables you to brew authentic frothy cappuccinos, lattes and mochas so you can enjoy coffee shop specialties right in your office. Internal water filter brews the delicious drinks. Easy-fill water tank holds up to 0.73 gallons. Design also includes a removable drip tray. When space is at a premium, this compact refrigerator is the perfect companion. With a 4.4 cubic foot capacity, this refrigerator is capable of storing your items conveniently in a compact design. Slide-out glass shelves provide easy access to your items. Keep items frozen in the full-width freezer department. 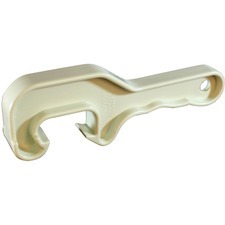 Recessed door handle and space-saving flat back design let you conveniently put this item in tight locations. Compact refrigerator also features a reversible door that swings to the right or left, interior light and adjustable leveling legs. The door also stores up to six 12 oz. cans, two-liter bottle, gallon-size jug and more. 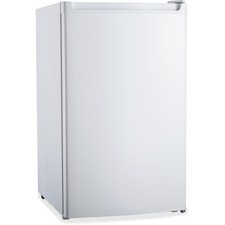 Refrigerator is ADA compliant and Energy Star qualified. 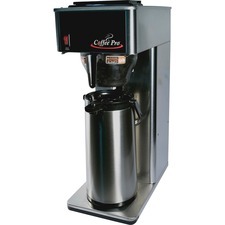 Stainless steel brewer offers a fresh water brewing system. Brew through stem on airpot. Included airpot stores and serves fresh hot coffee for hours. 120 volt. Commercial rating UL and cUL listed. 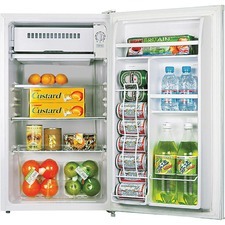 Compact refrigerator is perfect for small office use. With the reversible door, finished back and adjustable leveling legs, you can fit it easily into your work area. The 3.3 cubic feet of nonlocking refrigerated storage offers a spacious chiller section with an ice cube tray, four shelves and three more shelves in the door. The door is equipped with a can dispenser, bottle rack with space for two 2-liter bottles in the door and two other shelves for small items. Full-range, thermo dial control lets you determine the temperature. Refrigerator also includes recessed handle and manual defrosting. UL approved. Energy Star qualified. Pourover Airpot Coffee Brewer System brews 3.8 gallons (14.4 liters) of perfect coffee per hour. Simply pour cold water in top and coffee brews immediately. Brewer System accommodates 1.9 to 3 liter airpots (sold separately). Airpots are easily transported to remote meeting rooms, breakfast bars and keep coffee fresh and hot for hours. SplashGard funnel deflects hot liquid away from hands. Internal components of brewer system are made from stainless steel. Completely portable pourover brewer requires no plumbing. UL listed for commercial and institutional use. 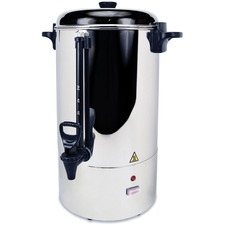 Stainless steel percolating urn holds 80 cups. Design offers permanent filter basket, locking safety lid, water level sight window and three-prong grounded cord. Safety spigot returns to "off" position. No filter required. Commercial rating UL and cUL listed.